“On the quasy-sumerian tablets from Tartaria”,autor A.A.Vaiman,with my comments. a tree is depicted with two animals standing on its sides. The researcher compared this representation with the impression of a Sumerian seal. 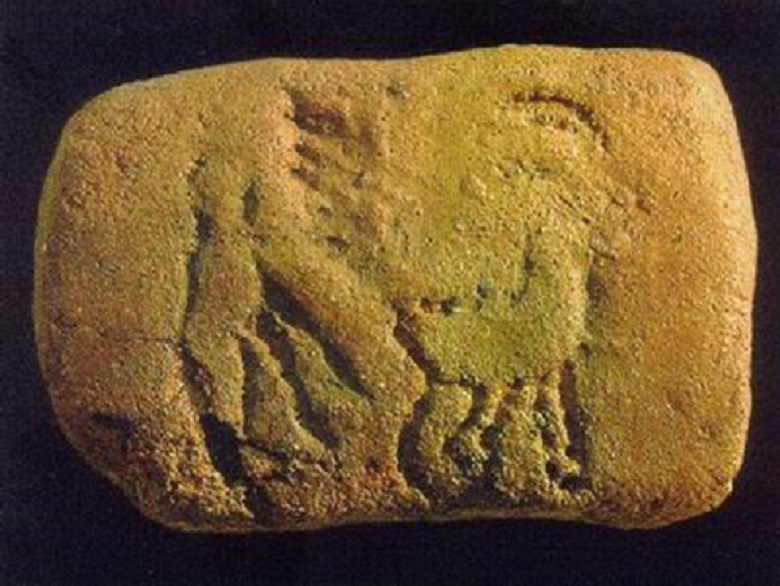 Two other tablets (figs.2,3) carry signs, many of which, according to Vlassa, are either identical with, or very similar to, those inscribed on the tablets from Uruk IV (early Proto-Sumerian script). The sensational find has gained a wide publicity. The most significant paper that has appeared so far is that by А.Falkenstein who has basically supported Vlassa’s conclusions. Falkenstein has compared the Tàrtâria tablets with those from layer III in Uruk and Jemdet-nasr (late proto-Sumerian script) using a number of criteria, such as clay, format, stylus, structure of the text, signs. He has proved beyond doubt that the script of the Tàrtâria tablets had been directly influenced by the proto-Sumerian script. At the same time, the tablets have not been studied in sufficient detail yet. The present article is yet another attempt at studying the Tartaria tablets. It offers more accurate tracings of certain signs; also, a new attempt is made to identify the Tartaria signs with both early and late versions of the proto-Sumerian ones (see our list on fig.4); some characteristics of the Tartaria script are discussed, providing a possibility to assess the degree of their independence with respect to the proto-Sumerian script; a tentative interpretation is suggested for both the separate records and the texts in general. First and foremost, according to published photographs, the copies of the tablets need to be corrected. The most important corrections are as follows. Tablet 2: 11, sign No.9 (fig.4): the cuneiform oblique dash (fig.2) is not shown. Tablet 2: V, sign No. 10 (fig.4): the middle horizontal incision (fig.3) is not shown; III and IV: the dividing incisions (fig.3) are not shown. It appears that the published copies have been made from the photographs rather than from the tablets themselves. We have already mentioned that three of the Tartaria signs (Nos.9, 10, and 16) have been incorrectly identified by Falkenstein. In sign No.9, the oblique dash has not been taken into account, and its presence makes it impossible to identify this sign with the proto-Sumerian sign No.260 (Falkenstein, 1936). Rather, it should be identified with the proto-Sumerian sign No.214 (Falkenstein, 1936). Sign No. 10 has been identified with the proto-Sumerian sign No.810 (or 543, see Falkenstein, 1936); however, the latter has two vertical lines inside, which are absent in the Tartaria sign. The identification given in our list is self-evident. Sign No. 16, for no apparent reason, has been identified with the proto-Sumerian sign No.753 (Falkenstein, 1936), although, judging by the context, it should doubtless be identified with the proto-Sumerian number No.905 (Falkenstein, 1936). As to sign No.l, in the published copy of tablet 2 (fig.2) it looks like two angles (see I 2, fig.4). The horizontal line is admittedly vague; yet its traces are evident in the photograph, which indicates that this sign should be identified with the similar sign of tablet 3, I 1 (fig.4). Altogether, sixteen of the eighteen Tartaria signs have been identified with the proto-Sumerian ones. Perhaps in the future it will be possible to find proto-Sumerian prototypes for the two remaining signs as well. Because signs Nos.2, 4, 6, and 10 of the Tartaria tablets (fig.4) have only early proto-Sumerian parallels, it may be assumed that other Tartaria signs, too, were borrowed from the early, rather than from the late, proto-Sumerian script. It has already been mentioned that not just the signs (possibly all of them) were borrowed, but other things as well, including the material for writing, the rectangular or round shape of the tablets (the latter occurs, although rarely, in layer IV of Uruk), the manner in which the text is divided into parts by means of vertical and horizontal incisions, and the technique of writing. However, the borrowed elements are transformed in such a way that one should speak of an independent Tartarian script rather than of a Tartarian version of the proto-Sumerian script. First and foremost, people who created this script, in contrast to the Sumerians, used only knife-shaped styluses. The Tartarian script differs from the proto-Sumerian one also in the construction of the texts. Each of the two texts is divided into columns by a vertical incision, and each column is divided into lines by horizontal incisions (table 3, V, provides an exception, see fig.3). In each collumn, the first line from the top contains a number and what is probably the name of the thing counted, while the second line is composed of one to three signs which are not numbers (see tablet 3, I, fig.3, for an exception) and which explicate the numeric record of the top line. As it has been stated above, such a construction is not possible for the proto-Sumerian texts, in which just one line would suffice. Horizontal incisions on Tartaria tablets are situated directly under the signs of the top lines, which is never the case on the proto-Sumerian tablets. Signs on the Tartaria tablets are arranged so that they fill up all the available space, creating an impression of a completed text. It is especially evident on table 3 (fig.3), where the signs of the top lines are situated quite close to the upper margin, while the signs of the bottom lines come close to the lower margin; as a result, free space is left above the signs in columns II, III, and IV. Such an arrangement of signs is not observed in proto-Sumerian texts. Certain important differences between the Tartarian script and the proto-Sumerian one are related to the orientation of various elements. Nearly a half of Tartarian signs (Nos.l, 2, 3, 7, 9, 15, 16, 18) are rotated 90 degrees anticlockwise relative to their Sumerian prototypes (fig.4). Admittedly, such rotation occurs also in the early proto-Sumerian script, but these cases are exceptional. While in proto-Sumerian texts the higher-order digits are placed above the lower-order ones, making up a column, in tablet 2, II 1, of Tartaria (fig.2) higher-order digits are situated to the left of the lower-order ones, making up a line. It would be natural to suppose that such a line was read from the left to the right. It is quite likely that all signs written in a line on the Tartaria tablets were read in a left-to-right fashion (see tablet 2: I 1,2; И 1,2, see fig.2); but being arranged vertically, they were read from top to bottom (tablet 2: I 2, II 1,2, see fig.2; tablet 3: V, sec fig.3). The columns were probably read in the same way as the digits in a line, from left to right. It should be reiterated that in proto-Sumerian texts signs within lines, except digits, are scattered in an apparently random order, while the adjacent columns are read from the right to the left. Finally, in contrast to what is seen in proto-Sumerian texts, numerical designations in Tartaria tablets do not always precede the non-numerical ones. Thus, in line I i of tablet 2 (fig.2) the numerical symbol is placed to the right of the non-numerical sign, while in line II 1 of the same tablet it is situated below, so in both instances the non-numerical sign precedes the numerical one. Taking into consideration the proto-Sumerian parallels, non-numerical signs in these lines may be interpreted as designations of the things that were counted. All the above brings us to the conclusion that in the language of the Tartarian tablets the names of the things counted apparently precede the respective numerals, or, more generally, the names of the defined things precede the definitions. The abundance of numerals on the tablets indicates that the latter were economical documents. The meaning of the numerals and of some other signs may be quite safely established by the meaning of their Sumerian prototypes. A certain degree of caution, however, is required since the borrowed signs could have some shades of meanings or even new meanings which were not inherent in their prototypes. Sign No. 15 (fig.4) is a numeral (originally sixty; however, after having been borrowed. it could acquire the meaning of the respective key numeral in the decimal system, one hundred). I 2. The two upper signs, Nos.3 and 1 (fig.4) may mean (left to right) “given” (“distributed”) and “barley”, respectively, and sign No.7 (fig.4) below it, “supervisor”. II 1. The upper sign, No.2 (fig.4) means “goat” or “sheep” (one specimen). Below it, there is a row of numerals: 600, 60, 10, 10, the total amount being 680 (or 1000, 100, 10, 10, totalling 1120). All together may signify 680 (or 1120) head of goats (or sheep). II 2. The central sign in the line is No.5 (the meaning of the respective proto-Sumerian sign is not known), and to the right of it, two signs, No.ll, “sun”, “daytime”, “white”, and No.8, “sanctuary”. The combination of the two latter signs may be read as LARSA, the name of the Sumerian town. So the inscription on tablet 2 may be tentatively read as follows: 11,2 Sixty (or one hundred) agricultural workers, BA.SE, supervisor. II 1, 2 Six hundred and eighty (or 1120) head of goats (or sheep). Tablet 3 (fig.3). On this tablet, numerals are present only in the middle three columns, II, III, and IV. I 1. Sign No.l (fig.4): “barley” (or, more generally, “grain”). I 2. Sign No. 13 (fig.4) cannot be identified with any proto-Sumerian prototype. II 1. Sign No.18 (fig.4), “one”, repeated five times and thus meaning “five”. II 2. Sign No.10 (fig.4). This sign is identified with an early proto-Sumerian sign, which, however, has not been identified with any sign in the later script. It appears likely that columns I and II should be viewed together: I 1, “grain”, I 2, a cubic measure; II 1, “five”; II 2, a name or a position of a person. III 1, 2, and IV, 1, 2. The two top lines in both columns contain the same sign, No.12 (fig.4). Apparently, in early proto-Sumerian texts the respective sign already denoted a cubic measure, SILA, probably that of oil. In the Tartaria tablet, this sign, judging by the context, also stands for a cubic measure of some product. The bottom lines of the columns contain signs Nos.4 (its meaning is unknown) and 6, “calf”. Like the sign in the bottom line II, these signs probably signify a person’s name or position. I 1, 2 Of grain… (an unknown measure). II 1, 2 Five (to such-and such). HI 1, 2 One SILA (cubic measure),… (to such-and-such). IV 1, 2 One SILA (cubic measure),… (to such-and-such). V … No other clay tablets with inscriptions have so far been discovered in Tartaria, and the distribution area of this script is not known. The specimens described were found not in archives, but in a pit, which the excavator believed to be ritual. Before having been placed in the pit, the tablets probably served as amulets. This would explain the presence of holes in two of the specimens (figs.2 and 3). Apparently, strings were passed through these holes to suspend the tablets. 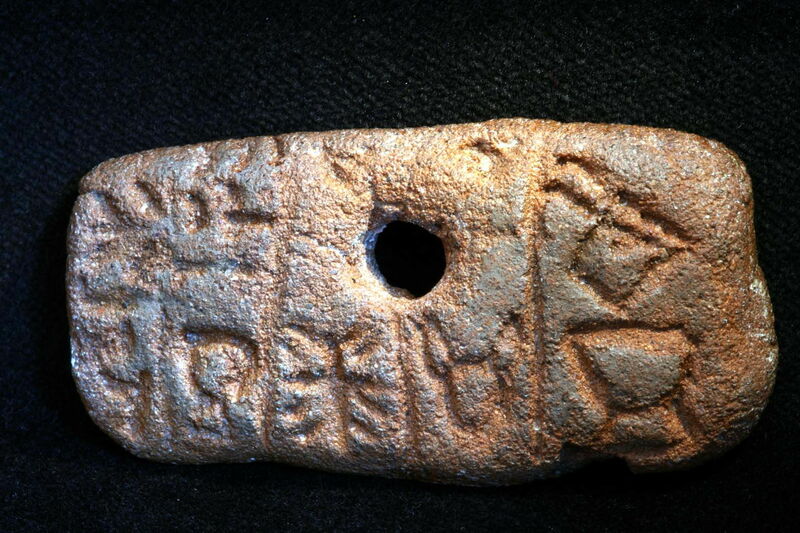 So the tablets described attest to the existence in Tartaria of an original script based on prolo-Sumerian prototypes. The belief that this script was invented prior to the proto-Sumerian one and influenced it, is totally unfounded. Because the Tartaria signs derive from early proto-Sumerian ones present on tabiets from Uruk layer IV, the Tartaria script apparently emerged in the last quarter of the 4th Millennium ВС. Nothing definite can be said as to where it was invented, but this hardly happened in Transylvania. More likely, its homeland was an area closer to Iraq. Functionally, the tablets were obviously economical documents.
! Autor not mention a possible relation of this tablet with the other twoo !! First, based on suposition that there are written there numbers and from this that it is about an economical/accounting tablet, partly could be correct, but the author not extract the ultimate possible meanings from the signs inscribed, nor realised that on the tablets there are long deep in time of paramount importance religion-related icons. So I sugest, or even stressing that the tablets possible are not limited to an strictly economical aspect, but could be related to an religious (offering) ritual ! So, the reading and interpretation of the tablets are quite rude “on the surface” if one don’t mind. I underlined with red the statements and findings with wich I not agree or consider inacurate or even wrong. With orange those wich I am not sure if correct , or posibility to be corect or not. —————– REVIEW OF fig. 4/ (table) VAIMAN’S SIGNS INTERPRETATION ——————— NOTE WHEN ONE SIGN IS CORRECT IDENTIFIED (+) BUT NOT INTERPRETED (-), I WILL CONSIDER THAT THE READING IS NOT DONE,(no gain,no advance); CAUSE A READING IS SUPPOSING TO GRASP THE MESSAGE FROM SIGNS TO MEANING. 9/2 apin Ku base,found,build/pure,noble/eat NO ! !! The autor no take in account long-time of paramount importance of sumerian and minoan icons related to their religion and rituals. (AN, Bull(sun-God,Labrys,etc.) !! This entry was posted on August 26, 2018 at 10:40 am and is filed under Ancient civilisations, LINEAR A/B, PROTO-CUNEIFORM, PROTO-WRITING, Tartaria tablets. You can follow any responses to this entry through the RSS 2.0 feed. You can leave a response, or trackback from your own site.